5 Laundry Room Design Basics to Know Today! Home » Blog Page » Advice & Tips » 5 Laundry Room Design Basics to Know Today! If you’re a homeowner, or you’re in the housing market, or even if you’re just a fan of the latest home renovation TV shows, then you’re probably privy to the fact that bathrooms and kitchens sell houses. That being said, a competitive market has seen more and more home renovators giving attention to other more frequently overlooked areas of the home. According to Forbes, one particular area within the home that has been shown a lot more love in recent times is the laundry. A space that is usually seen as a means to an end, laundries often get treated as an afterthought. Whether we like doing it or not, we all have to clean our clothes at some point – so why shouldn’t we be able to enjoy the space that we do it in? Before progressing too far along with your laundry room designs, ensure that your layout is oriented correctly around plumbing and electrical fittings. While it might seem the easiest way out not to move plumbing and drainage and electrical fittings, many homeowners tend to miss the wood for the trees and then end up with a design no different to what is already there. Moving these fittings is neither difficult or expensive when using qualified and licenced tradespeople. If you have any concerns about the plumbing or power supply in your laundry room, you should seek professional advice from the folk at All Bathroom Gear. Laundry rooms usually aren’t large, because they usually don’t need to be. Even a small space can be perfectly pleasant and functional, so long as you make clever use of the space you’re working with. 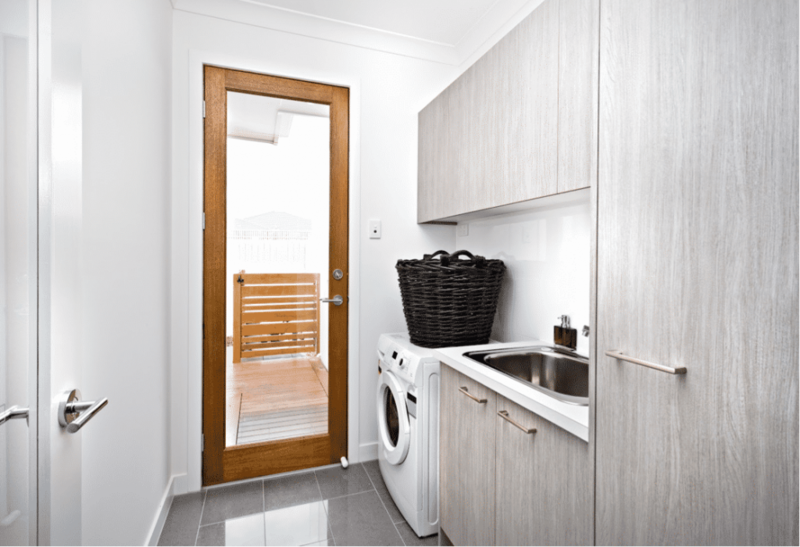 If you only have limited floor-space available, then you might favour a front-loading washing machine, which gives you the benefit of having more bench space or putting a dryer directly above it (if the washing machine can’t withstand the weight of a dryer on it, you could wall-mount it). On the other hand, if the room is narrow and an outwards swinging door is likely to be problematic, then consider getting a top-loading washing machine instead. Houses come in all sorts of shapes and sizes, and some lack sufficient space for a dedicated separate laundry. While a washing machine in the kitchen is objectively odd, having one in the bathroom is a perfectly logical next-best-option. Again, just try to be clever with space; perhaps by building shelves and benches around the washing machine, so that the space above it can be used for storage. We’ve all experienced the frustration of hanging washing on the outside line, only to have it start pouring with rain shortly afterwards. Indoor airing racks can be a great workaround, except for when winter strikes and it seems to take days just for one pair of socks to dry. Having a clothes dryer can be tremendously useful during the cold season, but it can also cause a lot of excess humidity. If you’re going to have a dryer in your laundry, or even if you just plan to have a clothes-horse in there, then you need to ensure that there is adequate ventilation in the room. Excess moisture in the home can cause damage that is costly to repair. If it’s not possible to include a window in your laundry room, make sure that you have a ceiling fan or some other method of air conditioning available. Despite modern minimalist trends, most people still accumulate a lot of things. (We honestly don’t even do it on purpose – it just happens!) Where possible, laundry rooms should offer ample storage space for things such as linens, towels, spare duvet inners and blankets. When you’re designing a laundry, think of where you’re going to put things such as detergents, fabric softeners, and emergency bleach. Given that your laundry room is a dedicated space for cleaning, why not store most of your home cleaning supplies in it? If the space allows for it, create storage for things that would otherwise clog up your kitchen or bathroom cupboards. You may also want to consider having a tall cupboard for household items such as ironing boards, vacuums, and mops. Again, if the space you have is limited then make use of vertical space by installing overhead cupboards. If you’re stuck for ideas, spend time scouring the internet for inspiration, or contact your local laundry design specialists at All Bathroom Gear for suggestions. Designing a laundry room does require some logistics and planning, but it can also be a fun DIY project. Try to be creative when approaching things such as paint choice, cupboard materials, and flooring. If the space is small, maybe choose a lighter colour to create the illusion of size. You can incorporate brighter colours with decorations such as wicker baskets, funky containers, or even plants. If you’ve got a tight budget and can’t afford to install dedicated cupboards, why not recycle some old furniture? A set of drawers or a stand alone wardrobe would make for great storage. If you’re not quite sure where to start, or if the entire undertaking has you feeling rather overwhelmed, then why not discuss your laundry room design ideas with the award winning designers at All Bathroom Gear?